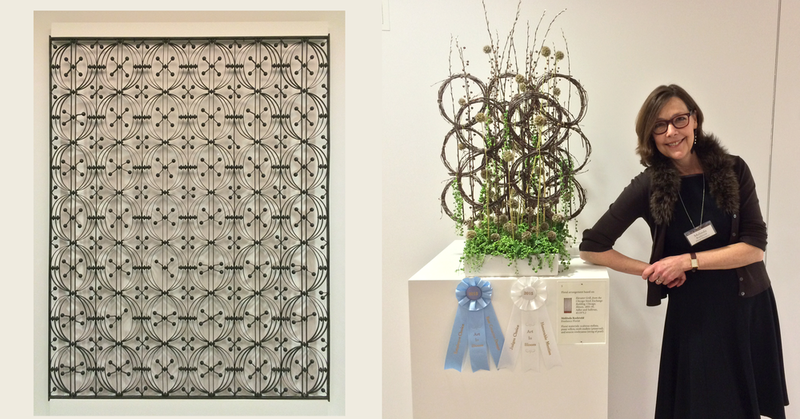 Melinda's 2015 contribution to the St. Louis Art Museum "Art in Bloom" was the interpretation of Dankmar Adler + Louis Sullivan | Elevator door from the Chicago Stock Exchange 1893. Produced by the Winslow Brothers Company. Her 2016 Art in Bloom flower interpretation of Claude Monet's Charing Cross Bridge gave her the People's Choice Award. painting of Lucy Turner Joy. Having lived in Europe for 15 years, Melinda always loved bringing fresh flowers home from the market. So the desire to learn more was a natural step. As a professional artist and floral designer, Melinda Roeleveld, owner of Les Bouquets, expresses her expertise in design, color and harmony not only in her paintings, but in her love for floral design. It all began more then 10 years ago when a friend in need requested help with flowers for her daughter's wedding. In just a few years, what began as a home business has evolved into a vibrant, continually growing small business. Melinda is now working with her husband/business partner, Matthijs and a team of assistants at a darling studio shop in the heart of Webster Groves. We have a very strong track record of going beyond our clients' expectations, we are meticulous about doing things the right way and we believe in integrity and high ethical work standards. We work with established wedding planners and vendors and have done weddings in all of the most well-known ceremony and reception sites in the St. Louis region. We believe there is no end to the possibilities in floral design. Flowers are as diverse as all other aspects of God's creation, bringing beauty and joy to all.